Matt is back in New York, Kirsten is back in the picture, and they are both looking to get back at the Jester and the Sons of the Serpent. Also, Javier Rodríguez is back doing both pencils and colors (with Álvaro López on inks). I think that pretty much sums up this issue! Or not. 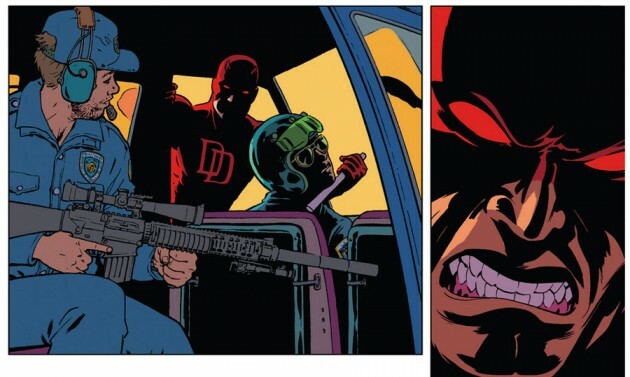 Joking aside, what has made Daredevil so consistently amazing for almost two and a half years are all the little details, beats and character moments that make up each and every issue. This is true of Daredevil #34 as well, and I really enjoyed this month’s story. I remember that one common complaint during the (also excellent) Brubaker/Lark run on Daredevil was that Daredevil was constantly put in a defensive position, attacked again and again, with little room to be proactive and mostly unaware of the devious plotting happening behind his back. While Mark Waid has made sure to keep Matt Murdock busy fighting off scheming villains – it really wouldn’t be much of a superhero comic book without them – this has also been nicely balanced with Matt often using the resources at his disposal to get the upper hand. These resources have come in many forms, such as Daredevil relying on his long experience of the legal profession to talk his way out of a bind and secure the Omega drive. Most importantly, however, he has been able to use his large network of allies to his advantage. These have ranged from fellow heroes, such as regular guest-star Hank Pym, or Doctor Strange, to the “ordinary” people around him. A couple of issues back, Matt put Foggy to work in helping him look for clues to the occult past of the Sons of the Serpent, and this time around, it’s Kirsten’s turn to play superhero sidekick. This, of course, entails Matt coming out of the proverbial closet and admitting to Kirsten that he and Daredevil are, of course, one and the same. Given that Kirsten has known this since issue one, it isn’t treated as a big deal, but it does suggest a potentially important shift in their relationship. While Matt has historically been bad about keeping his secret for very long around the women in his life, it does still signal that Matt now officially considers Kirsten someone who is a close enough friend (with benefits…) to officially share in the worst kept secret in the Marvel Universe. He comes clean to her following a very public display of his abilities (something he’s done before and which I will have reason to return to). He then asks for her help. Just like regular penciller Chris Samnee, Javier Rodríguez is credited as co-storyteller, and the result is a great-looking and visually engaging story. I very much enjoyed Rodríguez’s previous outings, but I think he really outdid himself here. The colors, also his, look fantastic as well. I will admit to being a little perplexed by the look of Doctor Strange this issue, and the scene in which Matt is running backwards in the park (at least I think that’s what he’s doing) is a little hard to follow. Those minor complaints aside, however, this artwork is wonderful, full of personality and energy. I particularly like Rodríguez’s take on Kirsten, and the amount of detail going into the scenes of people from around the city. López’s inked lines are just a tiny shade lighter than what we usually see from Samnee, but the end product perfectly matches the overall look this book has had for a long time now. Spectacular work all around! Okay, that’s it for now! I hope you guys enjoyed this issue too. Either way, please feel free to leave your comments below! Overall, great issue. I won’t mention specifics through fear of spoiling the issue for someone. But by the end of it Waid had me right in the palm of his hand as I honestly thought that a certain someone was a goner.. Phew! Two small things did throw me though. The first being some weird dialogue. When Matt says to Doc Strange “…what all could it heal?”. That’s gotta be a production error, hopefully fixed for the collections. And the second (minor) thing was in the pic above, the close up of Daredevil’s face. Looking at his nose, it’s like his mask is painted onto his face. There’s no seperation. Other than that, great stuff. I’m actually really liking Javier’s art! The final panel worries me. Does it worry anyone else? I just read the issue. I agree with your comments, once again. I agree with DIMETRE. The final panel worries me too. I am hoping for a positive outcome. Real life is depressing enough. I don’t need my escapism to be depressing as well. I enjoyed this issue, the end scenes with the helicopter were really tense and suspenseful, excellent job Waid. Javier’s art was terrific as well. I am glad that Waid keeps pointing out there is no clear easy solution to Foggy’s illness despite the vast wonders of the Marvel Universe. Pym and Stark with all their high technology are unable to ‘cure’ Foggy and now Strange admits that magic does indeed have it’s limits. That was a good small scene between the two. It’s interesting that Matt ‘reveals’ his secret to Kristen, it definitely alters their relationship and I’m curious to see where they go from here. But I do agree with some criticism I’ve read elsewhere over her involvement with Matt’s plan. Why was she needed? Her only participating role was to read the ‘name’ of the serpent in the Darkhold pages. Couldn’t Nate have done that? I’ll tell you what I loved about this issue – the secret identity reveal. I love secret identity reveals! Granted, Kirsten has known for a good long while about Matt’s little secret, but knowing and having it actually demonstrated are two different things. I just loved the way this was handled, with Matt keeping pace with her while jogging backward, including jumping over obstacles that would have tripped up someone without a 360 awareness of their surroundings. Kirsten’s line “Why you don’t come with mustard and relish already on you I’ll never understand” is great. She knows, but now Matt shows her, hence her “wow”. What Matt does would be remarkable for anyone, not just a blind guy. It’s also great because Matt needs her help, but won’t ask for it without full disclosure and giving her a chance to say no. I love it because it’s not an accidental reveal, it’s not some villain exposing him, it’s Matt choosing to reveal his secret – something that at this point those of us who have read ahead know there will be more of. His greater ease – wonderfully shown both in dialogue and in the art – at being “out” with someone comes through. Matt really is happier being himself, FINALLY!, even with all the hassles that will bring him going forward.